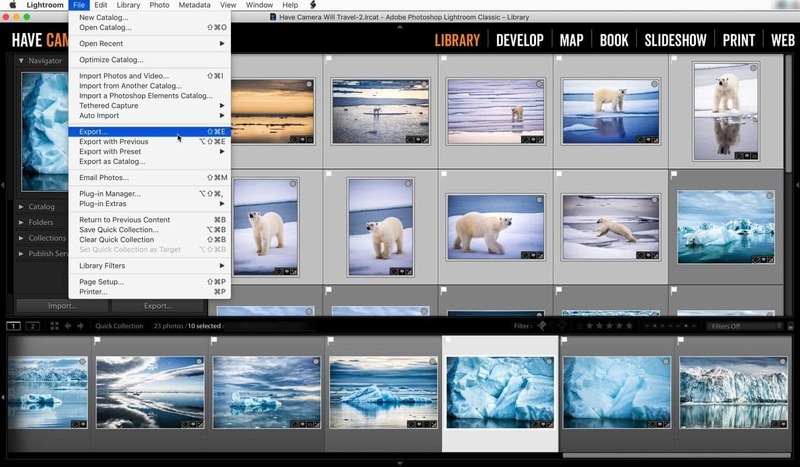 Before this option was available, when you imported images into Lightroom you had the option of having Lightroom generate new previews or creating none. The problem with creating new ones using the 1:1 or standard settings is that it's a slow process, and you can end up waiting for quite a while before you could get on with culling (ie. choosing the keepers). The problem with creating none (ie. the minimal setting) is that you need a preview for many basic tasks in Lightroom. It's the whole point of a visual interface; otherwise you'd just be using filenames. If you choose the minimal setting when importing images into Lightroom, those previews aren't there when you need them, so when you need a higher-resolution version to take a closer look, you have to wait for Lightroom to create a preview for that specific image. And, again, that's slow. But most cameras save an embedded JPG preview in the RAW files when it saves them to the memory card. Many cameras even make it a full-size image, not just a tiny thumbnail. It also reflects any filters or effects that you're applying the camera, but those aren't reflected in the underlying RAW file. So now Lightroom can use those embedded previews that already exist. Because it cuts out the generating previews process, it can speed things up immensely. It's one of the tricks that has been up the sleeves of PhotoMechanic for years that has give it such a strong reputation for speed. You enable this feature in the import dialog. At the top right of the dialog, under File Handling, you have a menu for "Build Preview" options. The previous options of Minimal, Standard, and 1:1 are still there. There's also now a new option of Embedded & Sidecar. To go along with this new option, there's a second setting that comes in very handy. 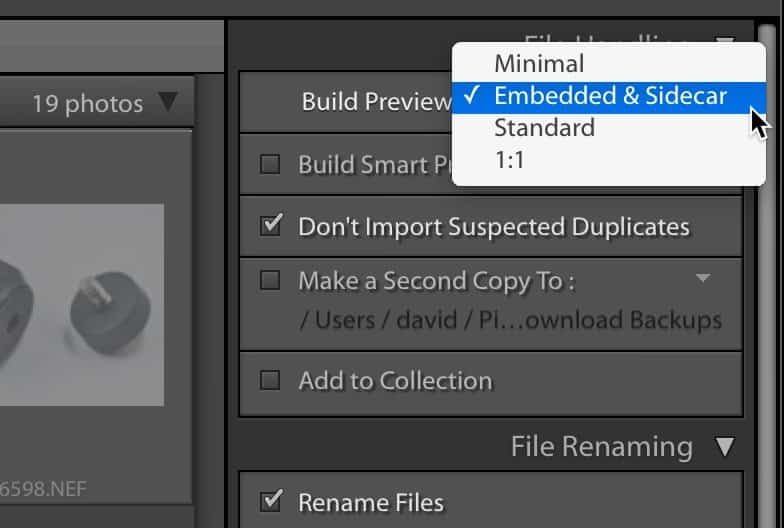 In Lightroom's preferences, you can now choose "Replace embedded previews with standard previews during idle time." 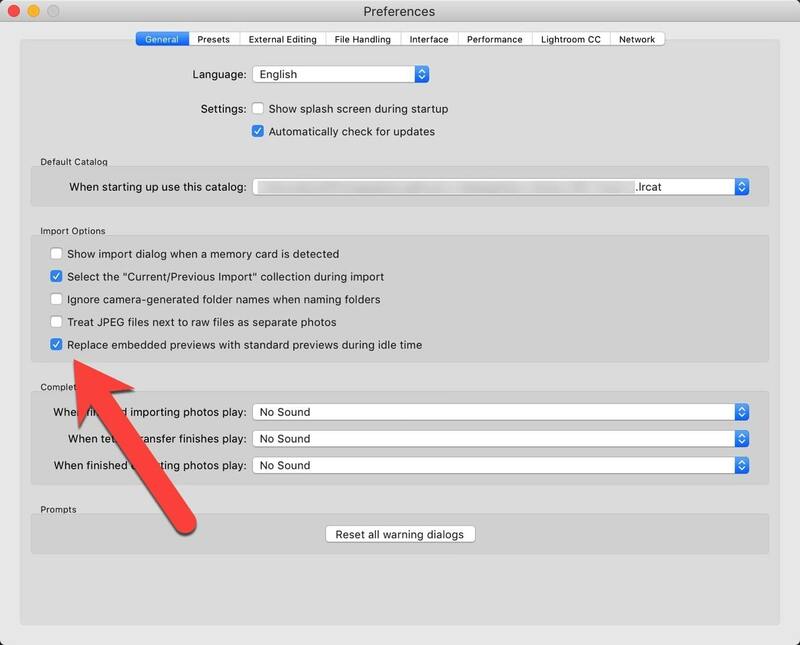 You can find this setting under Preferences > General > Import Options. This is only relevant if you're working with RAW files. Many newer cameras embed full-size previews, but not all do. Fujifilm and Olympus cameras use smaller embedded previews, but if you've enabled the RAW+JPG option when shooting with those cameras, this feature will use the JPG from those pairs (ie. the sidecar file). It's primarily useful for importing and culling images. Once you start editing the develop settings, Lightroom will need to generate its own preview to work with. But by that stage of the workflow, speed in working with large numbers of images should be less crucial and noticeable. This is one of those features that I'm going to turn on by default. It addresses one of the biggest bottlenecks in the workflow--waiting for Lightroom to generate previews before getting to work--and is one of the reasons I often turned to PhotoMechanic for faster culling. Basically, it means you can get cracking on the culling process right away. Then, by the time you're needing Lightroom to generate its own previews, you'll hopefully be working with a much smaller collection of images and the previews were hopefully already generated while Lightroom was idle. This is somewhat related, but if you're looking to extract the embedded JPG previews from RAW images, there are apps that can do that.